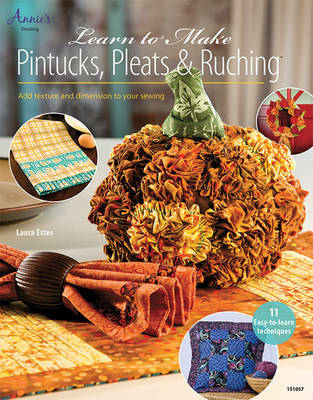 Pintucks, pleats and ruching adds texture and visual interest to home decor and accessories. All the projects in this book feature one of these easy to master techniques. Laura Estes will guide you through the steps and show you the tools of the trade that make these seemingly difficult textures, easy and quick to complete. Ruching, Pleating and Pintucks, all forms of fabric manipulation, add texture and visual interest to home decor and accessories. All the projects in this book feature one of these easy to master techniques. You will find adding these embellishments to projects rewarding, as well as combining them in future projects. Ruching projects use a Coin Ruching Guide. This style is quicker and easier than traditional ruching, and withstands any washing or cleaning your decorative items might need. Pleating projects use the Perfect Pleater, a tool that makes pleating quick and easy. Pintucks, very tiny pleats sewn in the fabric are easy, following lines you mark before sewing. Most of these projects are quick to make. Ruching projects require some hand sewing, but nothing that has to be perfect or exact. The Coin Ruching portions of these projects may be tucked in a zip closure bag and carried with you for stitching while waiting at appointments. Whether you are making these projects for yourself or as gifts for family and friends, you will find complete instructions, tips and tool recommendations for completing your projects. I hope you enjoy learning these techniques and will add pintucks, pleats and ruching to many of your future projects.